Although it may be a little intense for young tykes due to its alcoholism, poverty, and prejudice themes, “Into the West” is an overall charming and appealing family film with a compelling storyline. It’s plot is hugely unbelievable (two Irish lads rescue their magnificent white horse from an abusive owner and ride across Ireland evading the authorities at every turn,) but something about this story touched a warm fuzzy place in my heart. Gabriel Byrne plays the alcoholic father of two young boys, Ossie and Tito (Ciarán Fitzgerald and Rúaidhrí Conroy,) who live with their perpetually drunk dad in a squalid Irish tenement building. The boy’s grandfather (David Kelly) is the proud owner of Tir Na Nog, a beautiful white horse. When Tito and Ossie decide to smuggle Tir Na Nog into the apartment (not an easy feat considering the tiny size of the place is barely livable for a family of three,) the police confiscate the horse and give him to a shady and rich hobbyist. The duo track down the horse-owner and steal back the steed, riding him across the hills and fields of Ireland and getting into all sorts of trouble along the way. Meanwhile, their father John gets back in touch with his gypsy heritage and reconnects with Kathleen (Ellen Barkin,) an old friend in an attempt to track his sons. John is a interestingly compelling and three-dimensional character- sometimes volatile, sometimes violent, he loves his sons but constantly manages to disappoint them. He pressures the illiterate oldest (Tito) to learn to read because as it so happens, he cannot. Tito does not appreciate the fact that his father is trying to do what is best for him, and he and his brother believe John does not love them. Gabriel Byrne plays John as occasionally heroic, sometimes pathetic, but never as a blunt, angry stereotype. There are fantasy elements considering the almost supernatural majesty of the horse, but they never take over the human element of the story, which is closer to British Social Realism than director Mike Newell’s later J.K. Rowling adaptation “Harry Potter and the Goblet of Fire.” While “Goblet of Fire” is my favorite Harry Potter adaptation, “Into the West” is a little more low-key, more about growing up and learning to let go that sorcery and magic. 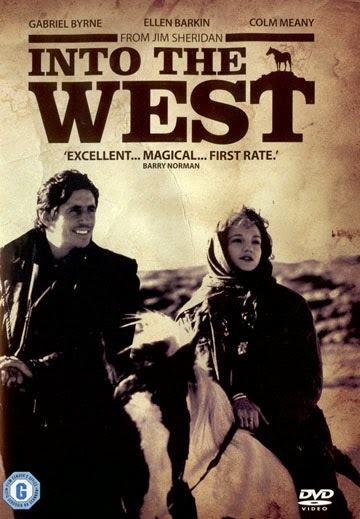 There are relevant social commentary (reflected by the prejudice towards the ‘travelers,’ the pressure of impoverished conditions, and the less-than-kosher treatment of the horse by the rich horse breeder,) and the acting is pretty strong overall, especially by Gabriel Byrne and the oldest son Rúaidhrí Conroy, although the performance by Ciarán Fitzgerald (Ossie) can be a little tiresome. 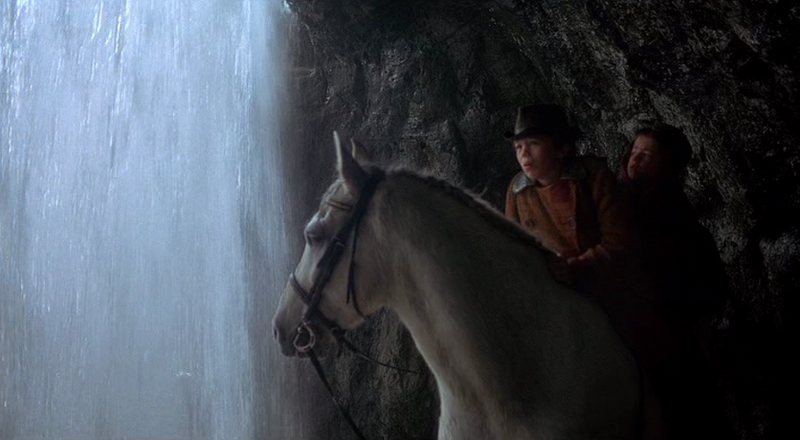 Overall, “Into the West” is a good kid’s movie with a lot of heart. Consider this a a superior alternative for teens and tweens to the the “Twilight” films and “Alvin and the Chipmunks- The Squeakquel” (God help me.) It is a rarity- strong and underrated family film that remains interesting after you turn ten. Worth watching for kids and adults alike.